Electric heat tracing system essentially comprises components such as electric heat tracing cables (parallel constant watt, series constant watt, power-limiting, or self-regulating), cable end termination systems, power connection kit, RTD sensors or control thermostat, in-line kits, thermal insulation, monitoring and control panel, and other accessories. Commercial usage of electric heat tracing systems began in the 1950s when these became an alternative where steam tracing could not be used. Electrical heat tracing systems were used in electric tracing of transfer lines for oil, asphalt, and waxes. The oil & gas industry is the major application area of electric heat tracing systems. Oil & gas is a highly volatile sector globally. The oil & gas industry has been expanding at a sluggish pace in the last couple of years. The electric heat tracing systems market contracted significantly from 2014 to 2016. However, recent stability is anticipated to offer substantial expansion opportunities to the electric heat tracing systems market in the near future. Many new projects are also estimated to be awarded in the near future. This, in turn, is expected to boost the demand for electric heat tracing systems during the forecast period. Furthermore, rise in oil & gas exploration projects in subsea and the Arctic region is also anticipated to offer substantial opportunities to the electric heat tracing systems market. 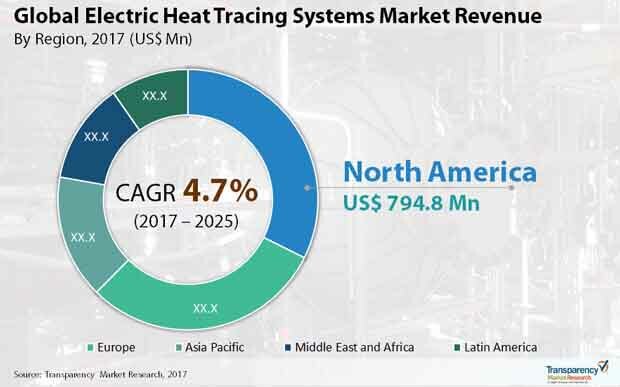 The electric heat tracing systems market is primarily driven by the low maintenance cost, increase in adoption of electric heat tracing systems over conventional steam tracing, and rise in investment in development of oil & gas pipeline infrastructure. Since the beginning of the 19th century, steam tracing has been the primary means of industrial heat tracing such as tars, petroleum residues, and waxes flowing through pipelines and other equipment in chemical processing and petroleum industries. Currently, steam tracing systems account for 70% of all the industrial heat tracing systems. However, tracing of vessels and pipe work is inefficient and complex to control in steam tracing systems vis-à-vis electric heat tracing systems. A reliable method to monitor and control steam tracing system is not yet available. This makes it unsuitable for applications such as process maintenance, where tight control of temperature is mandatory. Considering the entire tracing system, control & monitoring, and power distribution system, the total installed cost of electric heat tracing system is 3/4th of the total installed cost of steam tracing system. Electric heat tracing system is safer in terms of installation and operation since it does not use exposed circuits. Furthermore, the annual maintenance cost of the electric heat tracing system is considerably lower than that of the steam tracing system. The total installed cost, operation cost, and maintenance cost of electric heat tracing system is lower than that of steam tracing system. The former offers better proposition in terms of value. Thus, there has been a shift toward the adoption of electric heat tracing system over steam tracing system in industrial, commercial, and residential applications. However, high risk associated with the devastating effects of overlapping of heating cables is anticipated to hamper the electric heat tracing systems market. Electric heat tracing system aims to compensate heat loss and maintain the process temperature. It is used for freeze protection in a prolonged no flow condition owing to the relative high cost of electrical energy. It is also used for freeze protection and maintenance of temperature across piping, tanks, and instrumentation. Each electric heat tracing system is custom designed to suit specific applications. Electric heat tracing system utilizes electric power and transfers it in the form of heat to the pipe containing operational fluid. It must be installed correctly to ensure proper operation and to prevent shock and fire. Therefore, electric heat tracing cables should not be touched or overlapped. Minimum spacing between heating cables must be observed. The minimum spacing between cables is 1” (2.5cm). If after installation electric heating cables are touched, crossed over, and overlapped among themselves, this could lead to overheating and burnout, which can damage the electric heat tracing systems beyond repair. These outcomes of overlapping of heating cables are likely to hamper the electric heat tracing systems market in the near future. The electric heat tracing systems market has been segmented based on component, application, end-user, and region. Based on component, the electric heat tracing systems market has been segregated into electric heat tracing cables, power connection kit, RTD sensors (thermostat), and other accessories. In terms of revenue, the other accessories segment constituted more than 50% market share in 2016. Based on application, the electric heat tracing systems market has been divided into process temperature maintenance, hot water temperature maintenance, floor heating, and freezing protection. In terms of end-user, the electric heat tracing systems market has been split into commercial, residential, and industrial. Based on revenue, the industrial segment accounted for major share of the market in 2016. Based on region, the electric heat tracing systems market has been classified into North America, Europe, Asia Pacific, Middle East & Africa, and Latin America. North America dominated the electric heat tracing systems market in 2016. This trend is anticipated to continue during the forecast period. Key players in the electric heat tracing systems market are expected to benefit by entering into strategic alliances with oil & gas companies. Major market players operating in the electric heat tracing systems market include Pentair PLC, Thermon Inc., Emerson Electric Co., Danfoss, Parker Hannifin Corp, Chromalox (subsidiary of Spirax-Sarco Engineering plc), eltherm GmbH, BriskHeat, Urecon, Supermec Private Limited, and Raychem RPG. This report analyzes and forecasts the market for electric heat tracing systems at the global and regional level. The market has been forecast based on revenue (US$ Mn) from 2017 to 2025. The study includes drivers and restraints of the global electric heat tracing systems market. It also covers the impact of these drivers and restraints on demand for electric heat tracing systems during the forecast period. The report also highlights opportunities in the electric heat tracing systems market at the global and regional level. The report comprises a detailed value chain analysis, which provides a comprehensive view of the global electric heat tracing systems market. Porter’s Five Forces model for the electric heat tracing systems market has also been included to help understand the competitive landscape in the market. The study encompasses market attractiveness analysis, wherein applications are benchmarked based on their market size, growth rate, and general attractiveness. The study provides a decisive view of the global electric heat tracing systems market by segmenting it in terms of components, application, end use and region. These segments have been analyzed based on present and future trends. Regional segmentation includes the current and forecast demand for electric heat tracing systems in North America, Europe, Asia Pacific, Latin America, and Middle East & Africa. The report also covers demand for individual application segments in all the regions. The study includes profiles of major companies operating in the global electric heat tracing systems market. Key players operating in the electric heat tracing systems market include Pentair PLC, Thermon Inc., Emerson Electric Co., Danfoss, Parker Hannifin Corp, Chromalox (subsidiary of Spirax-Sarco Engineering plc), eltherm GmbH, BriskHeat, Urecon, Supermec Private Limited, and Raychem RPG. Market players have been profiled in terms of attributes such as company overview, financial overview, business strategies, and recent developments. The report provides the estimated market size of electric heat tracing systems for 2016 and forecast for the next nine years. The global market size of electric heat tracing systems has been provided in terms of revenue and volume. Market numbers have been estimated based on key application and regional segments of the electric heat tracing systems market. Market size and forecast for each major application have been provided in terms of global and regional/country markets.